Old stumps in a bog can tell a story just as well as a tree. This ancient stump is a remnant from Pennsylvania's lumbering days of the mid 1800's to the very early 1900's. The high stump tells a story of the lumberjack, his double-bit axe, and his crosscut saw - a fascinating part of Pennsylvania's history. 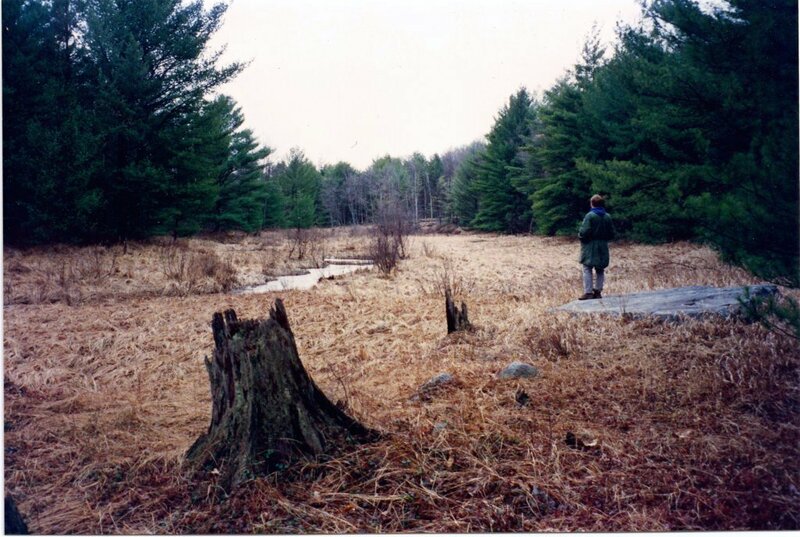 Once upon a time this area was a Hemlock palustrine forest community, tall and thick with Hemlock, White Pine, and some scattered hardwoods. Many of those trees probably sprouted back when Native Americans hunted this dark and quiet forest. 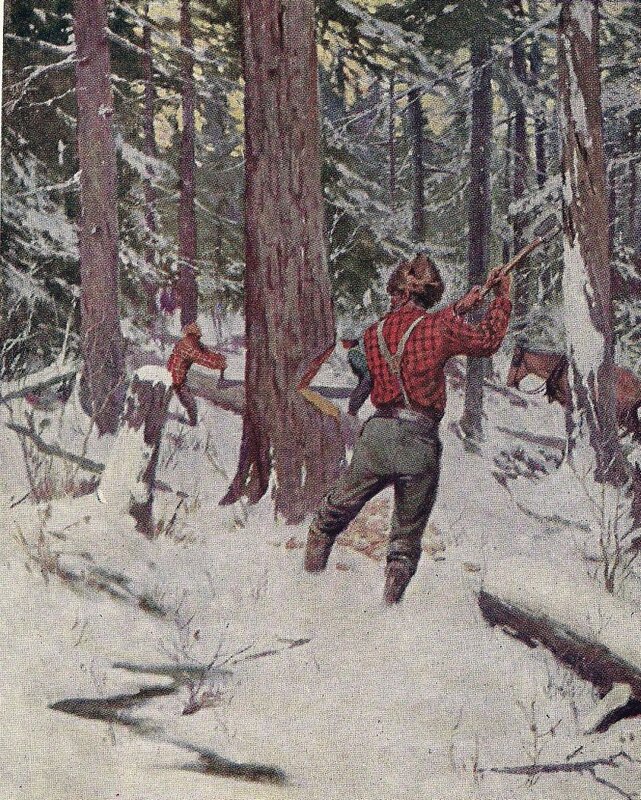 Then one winter day a hundred years ago, along came the lumberjacks - the swampers and the loggers - they laid their axes to the tall timbers and let the daylight into the swamp. That day a lumberjack, most likely wearing a red mackinaw, lowered his double-bit axe and made a face cut in this medium diameter (but tall) pine at a comfortable height for his practiced swing. Then he made the back cut with a crosscut saw that sent the tree crashing "down the mountain". After the "stick" was limbed, and the saw logs bucked and sniped, the teamsters came with their horses and skidded the logs to a landing where (judging from the bog's location) a railcar-mounted, steam powered Barnhart loader lifted the logs onto rail cars for the log train to haul to the mill. At the mill the logs were possibly sawn into boards for barn siding or perhaps some 2x's to help build a booming America. Charring on this stump, and others in the bog and surrounding forest, indicate a raging fire in the slashings. This fire, or fires, along with erosion, changed the soil conditions and prevented recolonization of the area. I wouldn't discount the role of beavers, and of course, Sphagnum moss. Then the bog formed, and like the stumps, lingered on for a hundred years or so, and told this story to a homeschool/nature guy/historian who decided to share it with people all over the world. The tall stump. Axe cutting is work best accomplished at a comfortable height... and above the buttresses, where there is less wood to chop. Chainsaw loggers cut the stumps low... gaining a couple more feet of log. The flat, back cut from the cross cut saw... there near my son's left elbow. The face cut, or undercut (opposite my son)...a notch cut with an axe to direct the tree's fall. The exposed roots... perhaps indicating erosion or loss of humus from fire. 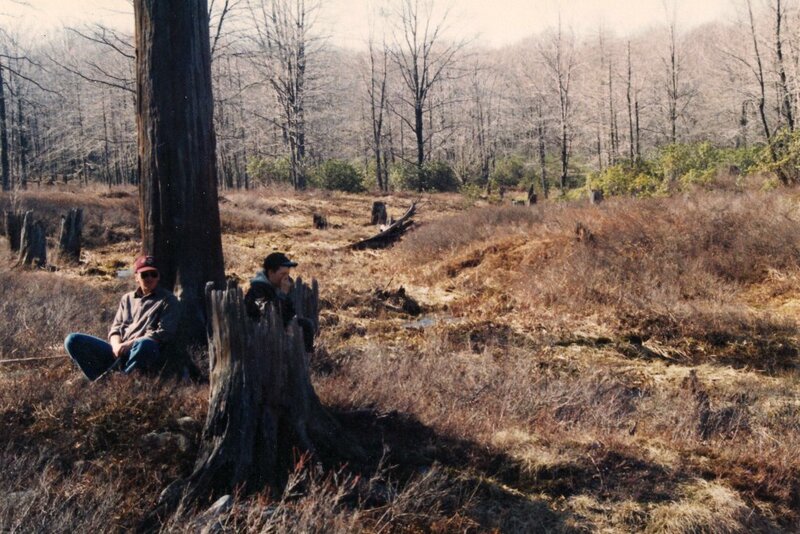 I can "see" those woodsmen at work in these ghost forests, or stump fields, that are scattered around at various locations here in Pa. When I see those old, tall stumps, I can "hear"... the ring of the axes, the cries of the loggers, and the crack and crash of the trees as the timber was "layed low"... Then... the creak of the harness, the stomping feet of the horses, the clank of chains, and the chuffing of the steam locomotive as the logs were moved away and down the mountain. In another swamp, pictured below, where I found evidence of a splash dam from the 1860's, I hear the rush of water and thudding of the jostling logs as the river drivers sluiced the logs and splashed them down the 'Scootac to the mill. See what I mean? Stumps, even one hundred and fifty year-old stumps, can tell a story as well as a tree. Holy cats, Dana ! Where I brilliantly deduce that there once were trees in the bog, you see so much more, so beautifully putting that history into words. Here -- I brought you this shiny red apple (lays it gently on teacher's desk).